Hi, I’m Michael — aka “The Boyfriend”. Lisa asked me to post something about cycling. Even though January isn’t exactly the prime cycling season, you can still enjoy your bicycle in the winter months. Most of us live in areas where cycling isn’t really an option this time of year or the only people we see out there cycling are die-hards or people that have no other means of transportation. I could make this post about all the great cold weather cycling gear that’s available, but I won’t. Instead, I’m going to talk about TV. Yes, TV. I have no problem admitting that I love to watch TV. I think there are a ton of extremely compelling and entertaining shows out right now and one of my resolutions is to watch more TV. You’re probably wondering how all of this works. That’s what I’m here for. Rest assured, you’re in good hands. First, you’ll need to plug your TV in. Then if you’re like me, you’ll need to get television service, or connect a DVD player, or a Google TV/Apple TV/gaming console type device, so you can watch a disc or Netflix. I find it handy to have a remote as well because I watch TV shows that I’ve recorded with my DVR and I have a tendency to fast forward through the commercials. Now, the bike. I mentioned that I can watch TV from my bike. How? I’m able to do this because I have a bike trainer. 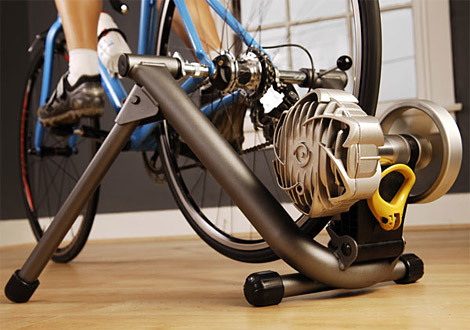 A bike trainer transforms your bicycle into a stationary bike that you can ride from the comforts of your own living room. This is probably a foreign world for many of you, so I will help you choose a good one. There are 3 basic types of bike trainers. Wind Trainers use a fan-like blade to generate resistance. Pros – These are usually cheap. Cons – These tend to be noisy and they can create wind in your house which may knock things over. Mag Trainers use magnets to generate resistance. Cons – Some are noisy, some are not. Fluid Trainers use a liquid to generate resistance. Cons – These are almost always pricey, often costing $200+. Most of these devices can fold up and be stored in a closet or under a bed. If you’re thinking about getting one of these devices, you should also get a riser for the front wheel that creates stability. This will assure that you’re level and that your handle bars can’t turn. This is a good thing. If you live in an apartment or your living room has carpet, you may want to get a training mat. These mats are designed to protect carpeting and absorb vibrations which generate sound. Your neighbor that lives beneath you will appreciate your purchase of a mat. These will work with most bikes. Some will come with replacement axles which are designed to fit perfectly within the trainers. If you have a mountain bike, you should get a street tire or a tire designed for trainer use for the rear wheel. 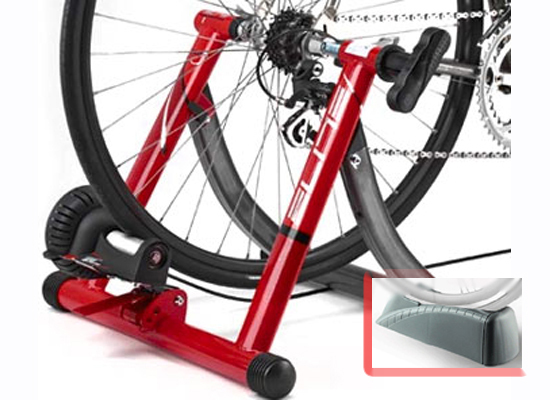 If you have a fixed gear or one-speed bike, you should get a bike trainer that you can adjust the tension via a remote. I use a Kinetic Road Machine fluid bike trainer. It does not have a remote for adjusting tension, but I don’t need that because I can adjust the resistance by shifting gears. I also wear a heart rate monitor while training so I’m assured to get a good workout. After a 5 minute warm-up period, I get my pedaling cadence up to 90 RPM and my heart rate up into my target range. This is what I use to determine what gear I should be in. After a minute of being in my heart rate zone, I start doing intervals where I shift into harder gears and get my heart rate up by about 20 BPM. Once I get it that high, I drop down gears while maintaining a cadence of 90 RPM until my heart rate gets back within the target range. Rinse and repeat. I do this routine 3-4x/week for 45 min to an hour. If you follow this routine along with a sensible diet, you will burn fat, gain lean muscle, and lose weight. But most of all, you’ll be able to watch even more TV and that’s what’s really important here. Lisa’s Note: I wanted to add that something like this is excellent for runners too. If you’re a runner you should be cross-training to prevent injuries. If you are already injured and can’t run? 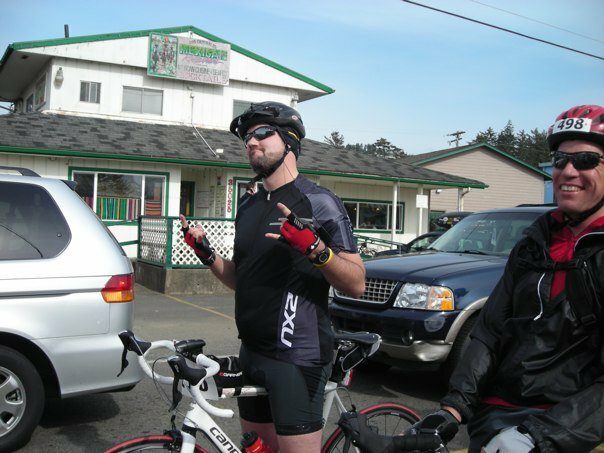 Cycling is an excellent alternative that really does work for losing weight! 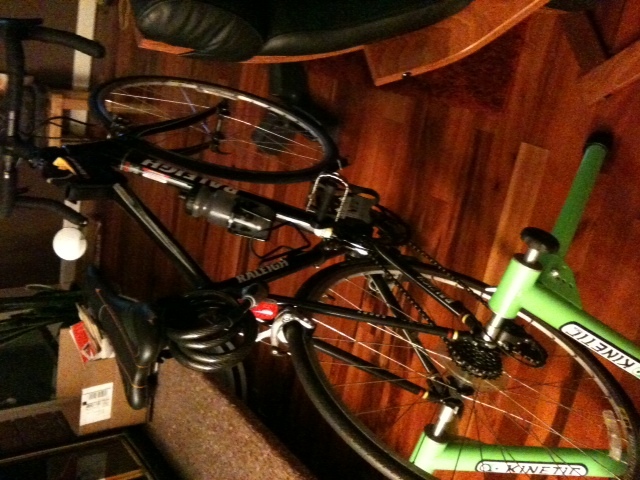 Lisa’s QUESTION: Do you have a bike trainer? Do you use it in the winter months? What kind do you have? Excellent guest post! I prety much love that watching more TV is one of your resolutions. I wish you luck on that. 🙂 I’ve always wanted one of these. Thanks for all the info! You should definitely get one. It’s been very beneficial in the winter time! Thanks so much for this! I bought a fluid trainer a couple years ago and have *never used it*. I was a little scared of it to be perfectly honest. You make it seem very doable. I think I’ll have to get it out and try it! Grab a riser to stabilize your front wheel and you’ll feel much more stable. Give it a try Lisa! I was nervous the first few times too! But Michael is right, the stabilizer makes a huge difference. Totally loved this post! I definantly feel inspired to watch more TV! I live in Texas, so with the exception of a few days a year we have pretty perfect weather for cycling or running. Unfortunatly, I haven’t owned a bike since I was like 8. Any suggestions on where to get information on bikes or where to start? Great post Michael, keep ’em coming. Hey Christi! Actually I was going to suggest to Michael to write a post about how to choose a bike next. He’s had a bunch of different ones and has a lot of insight on what’s good. Love the bike set ups!! That’s a great set up! I love it. I watch my hour long shoes (45 min without commercials) and it motivates me to go longer! Being able to watch my favorite shows on the DVR is a big motivation to get out of bed for my workouts in the morning. 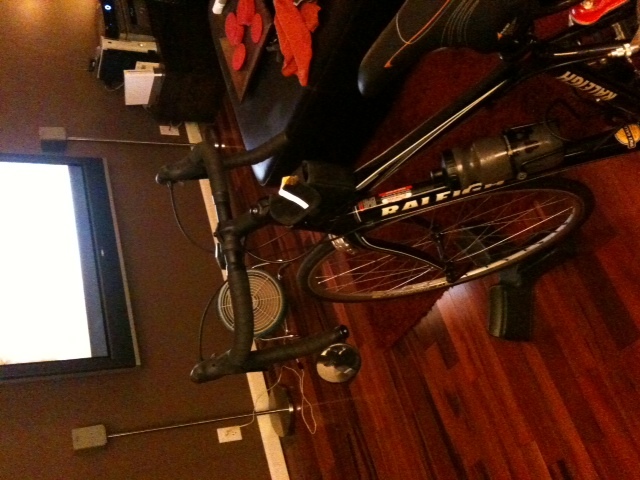 I won’t subject my husband to Private Practice, but I can enjoy watching it while I’m on the TM or elliptical. And, I don’t have to worry about falling asleep and missing the last 10 minutes! By husband rides a bike and has a trainer. Not sure which one, but he has a riser. He watches old sci fi movies and secretly catches up on Glee. Hehe he secretly watches Glee? Too funny! I still use my wind trainer from 20+ years ago (yes, the college days) but I’ve also been lucky to have access to a wide variety of trainers. Probably my favorite is the Kurt Kinetic Road Machine. But… I probably log an average of 10 miles a day on my old wind trainer and in doing so have built both incredible strength in the legs with added endurance as well. If folks have a mountain bike, I’d recommend that they check out a rim drive trainer. Its the best scenario for those not wanting to change out the rear tire of the bike since a rim drive trainer uses the the rear rim to propel the bike. 10 miles a day is impressive! Thanks for commenting. All your posts on the bike (and now your other half’s) have really made me think it might be a good idea. My husband works away and with 3 kiddies I’m not always able to make it to the gym in the holidays. I think it’s a great option for people with kids who can’t get to a gym! And when the weather is nicer, you can just go outside! I do have a trainer, well its my husbands. I am also using his bike this winter. I don’t know the type of trainer I know we bought it from http://www.CycleOps.com. The one thing I can’t do is watch TV when I work out. I have to be plugged up and listening to PodRunner (www.Podrunner.com) music. That is the only way I can find the strength to make it through my cycling routine. It’s not ideal for everyone, but I usually watch sports when I ride. I use the clocks that countdown that they show in the corner to time my intervals with. I usually listen to music via an iPod at the same time. I have a fluid trainer. Although I have not used it in awhile, this post makes me really want to go out in my garage and get in a good cycling workout. Thanks for the much needed motivation. What are you waiting for? Those TV shows aren’t going to watch themselves! I want one of these so bad but I just have a mountain bike. Are tires inexpensive? That would be a good question for Michael. Let me ask. 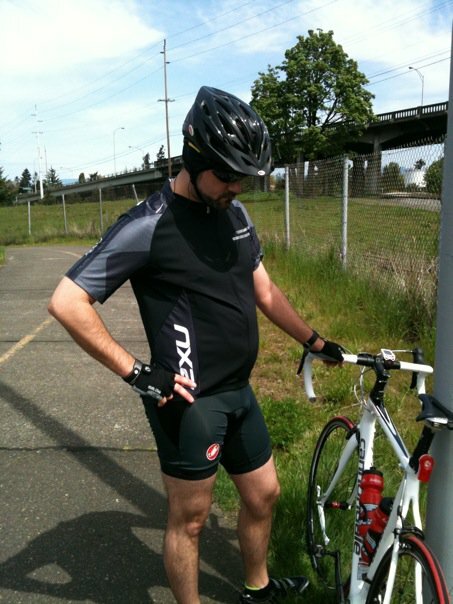 Although I don’t see why you couldn’t use a mountain bike on the trainer…? It really depends on what your tire looks like. If you have a traditional knobby tire, I don’t think it will work right. The resistance on these devices is created by pressing a wheel with a narrow diameter into your tire. I cannot imagine it will glide smoothly over the resistance wheel. If you have the smoother street or hybrid style of tires then I think it would work just fine. You can take your bike to a local bike store and have them put a street tire on the rear wheel. It should cost around $30 or so. Depending on your shifters, you may be able to easily remove the rear wheel and just take that to the bike store. Great informative post. So it looks like I’d have to get a different tire for my mountain bike. Bummer. Really? It won’t work with mountain bike tires? See my comments above to Jennifer. Hey Michael! Do you think the “mag” trainers can hurt your wheels in anyway? 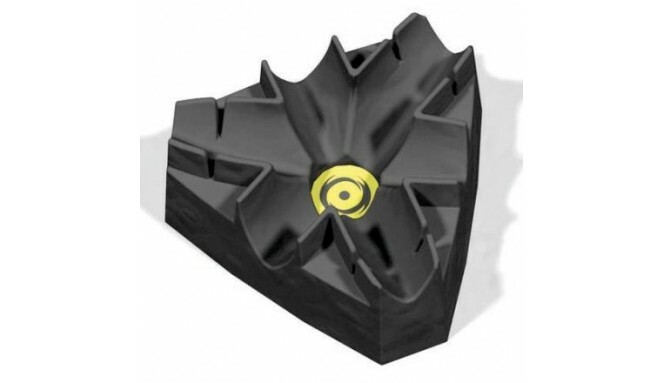 When I use mine I feel like they are going to ruin my tires and wheels. Maybe I just have to get used to it? Inflate your tires to whatever is recommended and you’ll be fine. I crank down my trainer’s resistance as hard as I can and I’ve not had any damage occur in the 3 years that I’ve been using my trainer. Hey guys I have a fixed gear bike, do you think that would be an issue for trainers adaptable to track bikes? Michael says that should not be a problem.